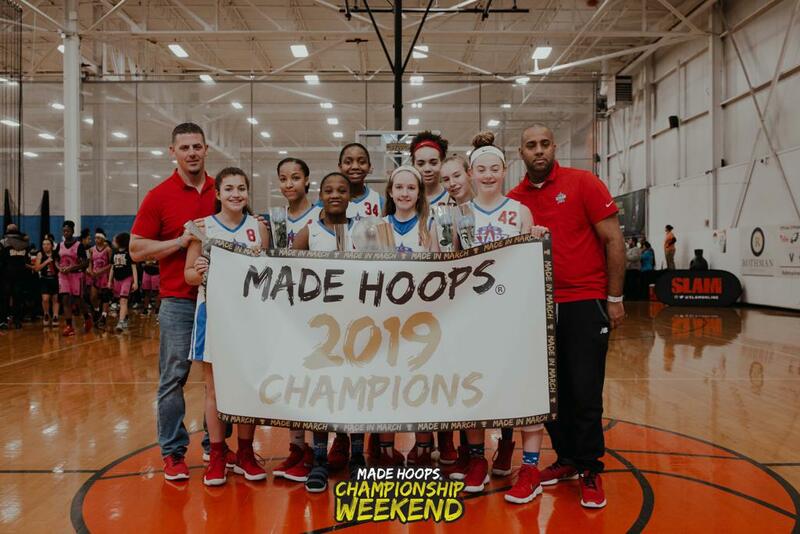 MCW Starz were crowned champions! The MCW Starz defeated Lady Prime in the quarterfinals and NJ Cardinals in the semifinals. The NJ Sparks defeated UPlay Canada in the quarterfinals and NY Gauchos in the semifinals. The NJ Sparks opened up championship weekend with the twin tandem of Mia and Mya Pauldo connecting on three three pointers and quickly jumping out to an early 9-2 lead. After a quick time out, the MCW Starz adjusted their defense by flattening out on drives to the rim and making just about every three contested for the remainder of the contest. Ahnay Adams led the charge with her on ball defense and constantly found Jasmine Davis and Jasmyn Cooper in transition for lay-ups. The Sparks, however, were not going away quietly. Ali Guzzardo made consistent defensive stops for this club by knocking down drives on the baseline to keep her team in it. In the end, the MCW Starz used a late run with about four minutes to go to capture this clubs first Rose League championship with a final score of 44-35. The quick scoring guard displayed her high IQ throughout championship weekend. She distributed the ball well but what was more impressive was when Pauldo had difficult match up as most opposing teams went man to man. Her strong handle and explosive first step allowed her to score at ease and it allowed opportunites to create for her teammates to put them in strong positions to score. Defensively, she is a quick on ball defender. This blue-collar combo player improved every time we watched her play throughout the season. She can consistently knock down the three and is one of the best on ball defenders in the league. Her ability to score in transition was unmatched all season. Guzzardo constantly wins the fifty-fifty balls and does a great job of making the extra play. This point guard played like a true champion all weekend. Adams disturbed the ball at ease in transition and constantly made the extra pass. She has a high IQ and it was on full display as she did a great job knowing when to push the pace or run the offense. The strong rebounding guard is also laterally quick and her anticipation on the defensive end is very strong. The combo player is one of the quietest but deadliest players in the league. While she’s long and laterally quick, Cooper has the ability to finish in transition. She is also known for her ability to score in the half court setting by finishing both sides of the rim while having a strong mid range game as well. She’s a strong rebounder and finishes put backs on the offensive end of the floor. Escanillas, who is a quick guard, continued her strong play during championship weekend leading her team to a third place finish in the league. She’s a strong on ball defender and takes high percentage shots. She is also a consistent shooter from three both set and off the dribble. Matthews, who is one of the most athletic players in the league, made a huge impact for her team this weekend. She continued to show her athleticism in transition by pushing the ball and getting to the rim at ease off of a rebound. She’s laterally quick on the press and is a difficult match up for most teams since she plays multiple positions on the floor. The New York native point guard had her NYC swag-scoring mode on full effect. Her strong handle and ability to get to the rim to finish the traditional three-point play continued. She was consistent from NBA range from three and this helped her to lead the team by knocking off the undefeated Mid Atlantic Magic in the quarterfinals. Every team needs a prospect like Mia Lewis. She’s tough and can do all of the little things that don’t show up on the stat sheet. Lewis has a consistent jumper and is known to score quietly but she gets the job done. She rebounds the ball well and has great anticipation on the press defensively. The floor general continued to take care of the ball and ran the point with poise. She continued to be a set shooter from three and showed off her mid range game helping her team to get back in the win column after a quarterfinal loss. The strong athlete continued her strong play on championship weekend. She has a high IQ on both ends of the floor as she did a great job of reading passes and getting steals that turned into lay-ups. Ceserati finished almost every play in the open floor as she ran the point and found open players in the half court. The young combo guard continued to play well on a big stage. She is a difficult match up for most teams as she played just about every position on the floor. Boslock scored the ball in a variety of ways this weekend by using her crafty finishes around the rim, her strong mid range game, and showed off her NBA three-point range. Boslock is also an athletic rebounder on both ends of the floor. Walker is a high scoring glue player for this club. She does a little bit of everything and can find new ways to score. She has the ability to make difficult contested baskets and can finishes the traditional three point play. She is consistent from the free throw line as well. Brampton Warriors are Rose 7eague Champions! When the dust settled for the seventh grade yellow division, both teams that made the championship hailed from Canada. Brampton Two huge rivals clashing in the championship were the Warriors and UPlay Canada. The Brampton Warriors had all answers in this one as they brought home their first championship in the Rose League. Every time UPlay attempted to go on a run, Brampton answered and went on a bigger one. Post player Jada Badiako led Brampton, who showed great improvement from earlier this season. She scored at will and presented a difficult match up for UPlay Canada. Point guard Isabella Karabestosos led the way early for her UPlay Canada club as she made big plays by finding open shooters. Michaela Carter kept UPlay in this one as long as she could by knocking down deep threes and getting to the rim in transition. Anaya Johnson and Candice Amasty were a strong force as they did their part on the defensive end of the floor. They constantly contested shots and did a terrific job of pushing the ball up the floor in transition. They both showed their ability to get the ball into the post and finish as well. The strong defense plays in transition closed out this championship match up with a win for the Brampton Warriors. Badiado was a big post presence as she showed the ability to score from both the block and high post. She is a strong passer out of the post when she can’t create for herself and she does an exquisite job of finding the open shooter. With an ability to block shots, Badiako is active around the glass on both ends of the floor. She made strong defensive stops and finished the traditional three point play to help lead her team to their first Rose championship. Johnson is a quick guard who made big plays to lead her team to a championship. She has the ability to shot the ball in transition and in the half court setting. She’s also a strong defender with great anticipation. Johnson is quick and athletic prospect that does a little bit of everything for this club. She constantly makes the extra play by winning loose balls and is a set shooter from three. Wu is a consistent shooter from three and has the ability to turn the corner and knock down the mid range shot. She has the ability to attack the rim and is quick on the defense end when the ball is rotated and can get into passing lanes. This is an athletic guard with a quick explosive first step. She can finishes at the rim and is a consistent foul shooter. Carter is a set shooter from three and is a strong on ball defender. She came up with big stops for her team as she led them to the championship game. Karabestosos is a true point guard and is the glue to this Canadian club. She’s able to see the floor well and knows how to score well for her size. She’s a strong shooter in transition and turns the corner well having an efficient mid range game. She is also a strong ball handler as well. Drake is one of the most athletic players in the division. She’s laterally quick and anticipates on the defensive end. Drake is constantly looking to make the extra pass and can score and finish on both sides of the rim. She shoots it consistent from three both off the dribble and set. This combo guard is one of the strongest defenders in this division. West does a great job of getting stops and turning it into offense on the other side of the floor. She is a strong driver and consistent shooter who can also rebounds the ball well on both ends of the floor. McClure is a young combo guard who had a high IQ. She distributes the ball well and can find her teammates in positions they can score. When it comes to shooting she is a set shooter from three. She has a strong handle and due to her quick first step, she can break the press with ease. Cutler is a big play-maker in transition and is a strong on ball defender. She has a quick first step and is a difficult match up for most guards she faces. When isolated in the half court, she can get to the rim flawlessly and can knock down the three from NBA range. This athletic forward has the ability to finish on both sides of the rim. Campbell is a high motor prospect that can rebound the ball on both sides of the floor. She plays through contact and finishes the traditional three-point play. One of the strongest multi positional players in the league, Craft constantly fights for 50-50 balls and has a great knack for causing jump balls when bigger players bring the ball down on the bounce. She shows great strength on the defensive end in the post.